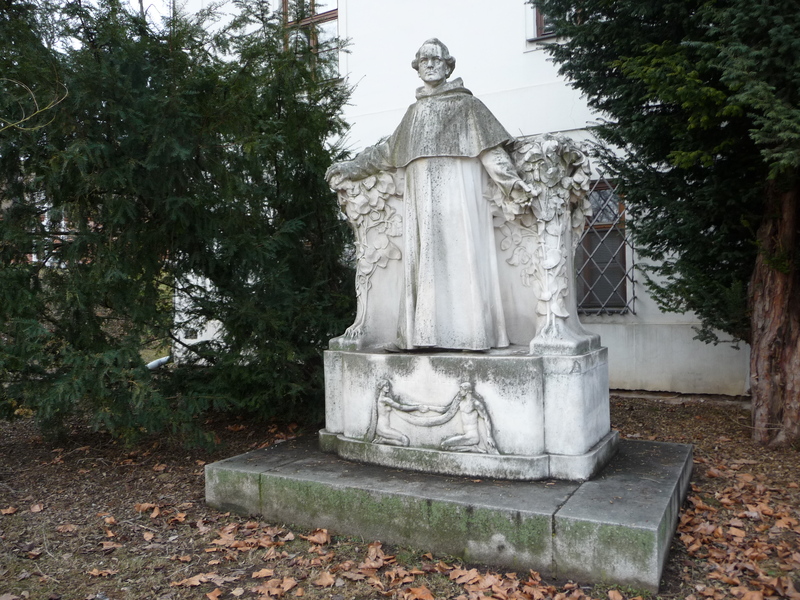 Yesterday we visited the Mendel Museum at the Augustinian monastery in Brno where Gregor Mendel worked with bees and peas (most famously) as well as apples and other plants. The instruments for his weather station and his careful notes were inspiring. His pruning kit is beautiful — the tools well-cared for and gleaming in their case. I was interested in the charts showing how he’d worked out the mysteries of inherited characteristics but I confess that there was entirely too much math for me to follow past the third generation. But it moved me to think about eye colour in my own family. I had two parents with hybrid-brown eyes — or at least that’s what I’m assuming. My mother’s eyes were very brown but my father’s were green, which I think is hybrid brown. My eyes are hazel, which again is hybrid brown (I think). John’s eyes are also hazel. His mother’s are too, though his father had grey-blue eyes. We have three children, one with brown eyes (hybrid brown?) and two with blue. I stared at the charts and wished that kind monk was present to explain to me the mystery of eyes. We have our hotel window while we pack to leave for Olomouc and we can hear the Sunday churchbells of Brno sounding out to the morning. I wish I could share them with you. ~ by theresakishkan on February 19, 2012. This entry was posted on February 19, 2012 at 8:16 am and is filed under Uncategorized.You can follow any responses to this entry through the RSS 2.0 feed.You can leave a response, or trackback from your own site.